My partner Ryan and I absolutely loved this place. The owner / caretaker are incredibly thoughtful, supportive and absolutely and this little cottage is a hidden Gem! I went here for my birthday, and was given a beautiful book as gift with a lovely written card. Everything is thought about, from kitchen and utilities, cooking and bathroom supplies the entire place is perfectly set up, you can’t find any better. I have stayed in many cottages, B&Bs and hotels, but this cottage was by far the best! The cottage has such a beautiful vibe, the outside Spa, fireplace is amazing. I cannot recommend this place enough, I have not stayed in a better place (seriously) we 100% coming back here. Thank you so very much!! This place is a delight. So beautiful. The grounds are lush-the outdoor shower is exquisite-the hot tub with its own pagoda is dreamy. The gas fireplace takes the chill off in minutes..so cozy and perfect. Truly a heavenly place to relax and feel spoiled. We booked this lovely cottage for our honeymoon and it couldn't have been more romantic. We loved the local art, lighting and seclusion of this cozy space. Outdoor spa and shower are lovely. Bathroom had a heated towel rack which was a welcome surprise. Bed linens were high quality and the mattress was comfy. Kitchen is fully appointed with high quality dishware and utensils. Pantry is stocked with coffee, tea, sugar a and few spices. Simple breakfast items are provided as part of your fee. I also want to call out the cleanliness. The cottage was immaculate. I don't get to see that often in my travels. We loved the place so much that we extended our stay by one night. Paul and Janet have created a very special space for travelers looking to slow down, unwind and just be. In our brief interactions via phone with the local cottage caretaker Catherine, we found her to be hospitable and kind. We also appreciate that the owners offer their guests a 25% discount on all future bookings. As a business owner myself who lived on Maui for several years, I'd add only one suggestion. It would have been a nice touch if we received a bit of aloha for the extra night we booked, e.g. the 25% return guest discount given it could have been seen as a new booking and the cottage was vacant that day. I mention it only as a suggestion for future situations like ours. The courtesy would have been much appreciated. In closing, this place rocks and we can't wait to come back next year. What a charming hidden gem! We thoroughly enjoyed making this our home base during our first trip to the Big Island. The VERY easy access to Hawai‘i Volcanoes National Park is what caused us to choose this cottage. In addition to the proximity to Hawai‘i Volcanoes National Park, we also loved the attention to detail in this charming cottage. Everything in the cottage is designed to make a couple cozy and welcome in the cool, wet climate near the volcano. The only thing we would have preferred is a larger bed. My husband and I are both big people - 6’6” and 5’10” - and are used to sleeping in a king bed. However, the mattress was very comfortable. We loved the outdoor hot tub, outdoor shower, outdoor fireplace and outdoor covered living room. We also loved the blankets and bathrobes and towel warmer. Terrific attention to detail made us feel very welcome and cozy in this charming cottage! The bed is very comfortable with an amazing garden window view. The location is extremely private (though we did encounter the groundskeeper on check-in and the housekeeper on check-out - friendly people!). Beautiful tropical gardens surround your little house, which has a mostly wood interior/exterior. There are mosquitoes, so we didn't linger on the outdoor furniture. Overall a very clean and modern feel (some cobwebs and dust in the corners, but nothing to bother about). Laundry facilities were useful, as the forest is damp! It downpoured for most of our stay, but the rain was romantic. Outdoor shower with hot water and forest-side hot tub. Nice touches like binoculars and a town map. The location is convenient for Volcano National Park and also the small town where you can find food. Lots to see and do if you like; we came back to the cottage to relax at meal times, as the driving distance is so short. I wish old guestbooks were there to look at, but there are some relaxing CDs and books to read. Full kitchen facilities. Fridge noise is a little loud as it is an open-plan house. Lighting and bathroom were nice; locks are secure. They left food essentials in the fridge for breakfast, so no need to buy those groceries (OJ, milk, cereal, jam, tea, coffee). Our favourite accommodation of the trip! The cottage is absolutely magical. Its private, the details are really special and the general amenities beat any hotel. It is the most romantic place I've ever seen and the longer you stay and look around, the more there is to discover. The hot tub was the highlight followed by the outdoor shower and outdoor fireplace. The cottage came stocked with breakfast and coffee, and more. I didn't want to leave! My husband and I had the privilege of staying at this special home for 3 nights. It is tucked away and very quiet and private, but also very conveniently located close to Volcano National Park and only a mile away from Volcano Village and it's shops and restaurants. The cottage was immaculate and extremely well-appointed. We loved the outdoor shower and hot tub, and used both fireplaces during our stay. We even got to meet Paul upon our arrival- he was as lovely and friendly in person as he was via email. I had looked a lots of B&B and rental options for this portion of our trip and I am so glad we decided to stay at Volcano Mist. Highly recommend this lovely retreat! Only 3 miles from Volcano National Park so easy to go see the lava flows day and night. And the cottage...lovely and secluded with private hot tub and outdoor shower. It's for couples only, just the one bedroom that only fits a queen bed. Two fireplaces, one outside and one inside. It was classy, nothing cheap. They've thought of everything- laundry detergent, bug spray, all the kitchen utensils you need, coffee, milk, etc. We were lucky enough to be there on a Sunday for the local farmers market 3 minutes away. Also enjoyed the Thai restaurant and seeing the glass blower studio nearby. Even in the rain, was a cozy place to be. Highly recommend! This is a hideaway that's at a secluded end of an avenue leading off from the volcano village area. It's privacy and sense of peace and quiet is unparalleled in my experience till now. My husband and I absolutely revelled in the romantic misty and forested surroundings. The luxurious outdoor jacuzzi was a welcome balm to sore muscles. Enough thanks cannot be owed to the owners for loaning this beautiful cottage for others to enjoy! The gentle and completely unobtrusive presence of the caretaker in a neighbouring cottage is a good support. The interior of the cottage is also very comfortably and tastefully furnished. Mahalo for a wonderful stay at your Wahi Malie (place of calmness). We enjoyed hiking and other activities during the day and then retreated to the Volcano Mist Cottage in the evenings. We loved the secluded outdoor hot tub. We got takeout food from Thai Thai close by in Volcano Village and enjoyed it on the covered lanai while we listened to the peaceful sounds of the songbirds in the rain forest and warmed up with the outdoor fireplace. 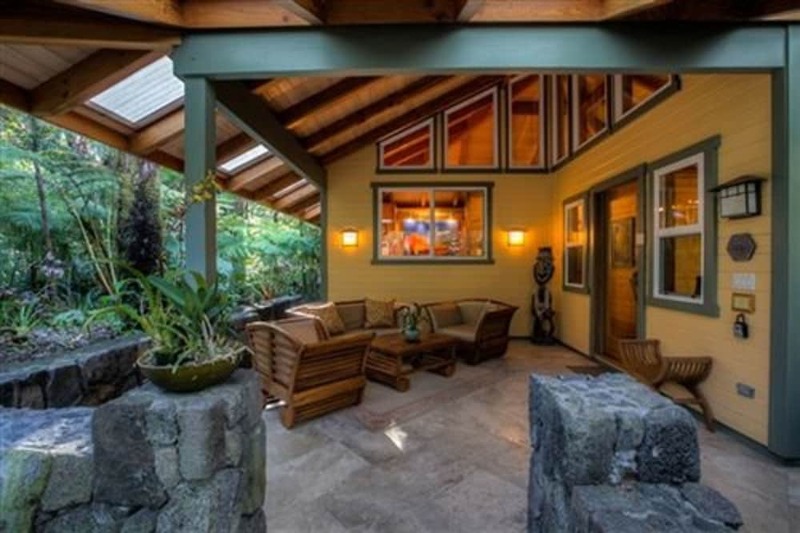 Volcano Mist Cottage is tucked away in complete seclusion. What a great way to renew, refresh, and "recharge." Highly recommended! Volcano Mist Cottage is a short distance from Volcano Garden Arts and Cooper Center. This 4-star bed & breakfast welcomes guests with 5 rooms and conveniences like free in-room WiFi, free self parking, and a spa tub. An LCD TV comes with satellite channels and a DVD player, and guests can stay connected with free WiFi. Other standard amenities include a kitchen, a balcony, and a living room. At Volcano Mist Cottage, guests have access to a spa tub, spa treatment rooms, and a terrace. You can take advantage of free parking, along with limo/town car service. A multilingual staff is on hand to help secure valuables, and offer sightseeing advice. Other amenities at this boutique bed & breakfast include laundry facilities, a picnic area, and a porter/bellhop. Recreation features at Volcano Mist Cottage include a spa tub. The preferred airport is Hilo, HI (ITO-Hilo Intl. ): 43-min drive, 28.6 mi/46 km. Hilina Pali Overlook: 10.3 mi/16.6 kmDistances from the property's location to the point of interest are straight-line distances and may not reflect the actual travel distance.